When people say they have “tons” of work to do, you understand it’s a colorful exaggeration. But when Kate Pond and Kat Clear use the word, they mean it quite literally. The two Burlington sculptors have many tons of scrap steel stacked and organized … and ready to go. Yes, all of it has to be moved. So does everything else — including more tons of metal fabricating, welding and lifting equipment — in the studio Pond has occupied for nearly four decades at S.T. Griswold’s in Williston. When S.D. Ireland bought the concrete manufacturing firm last month, Pond was shocked to learn that the new owners had other plans for Building 3 — “her” building. She and Clear, who’s shared the space for nearly four years, hope to find a home for all this stuff in a new working studio somewhere in the Burlington area. By the end of the summer. So if you’ve got a space for rent that’s well-ventilated, covers at least 2000 square feet, and can accommodate large vehicles occasionally coming and going, now would be the time to step forward. “Heat and a bathroom would be nice, too,” Pond notes wistfully. Pond met Doug Griswold in 1971 when both were involved with the International Sculpture Symposium, headed by late sculptor Paul Aschenbach, on the Burlington waterfront. “Doug was in charge of organizing the concrete donation for the artists to build sculptures, and I was an apprentice for one of the invited sculptors,” she explains. The two formed a lasting friendship. “Soon after the sculptures were placed on Interstate 89, I moved into my new workshop at Griswold,” says Pond, who acknowledges she’s paid “nominal” rent for the space. In return, Griswold acquired a reputation for supporting the arts, and what Pond calls a “value-added” sculpture park on the grounds alongside Industrial Avenue. Those 14 works in steel and concrete now have to go, too. Back in the ’70s, Pond made steel-and-mirror words and letters, and the outlets she acquired for them led her to far-flung exhibitions and numerous public and private commissions. Notably, her World Sculpture Project — sundial-related sculptures that cast shadows at the equinox and solstice — has been assembled in Québec, Norway, Japan, Hawaii and New Zealand. It includes time capsules filled with children’s art that will be opened and exhibited in 2015. Over the years, Pond has created local public art as well, including “Kiss II” at the Fletcher Free Library in Burlington, “Steelhead” in the Winooski Falls Park, and the steel floor grating in the entry to the renovated Firehouse Gallery. Before she leaves the Griswold — er, Ireland — space, Pond says she needs to complete a “self-portrait” — a mobile that dangles steel eyes, a nose, a mouth and an ear — for the “Exposed!” outdoor sculpture show in Stowe. The deadline also applies to a serene-looking, 10-foot-high piece for a private client’s meditation garden in Burlington. Clear worked as Pond’s apprentice for a year before joining her full-time in 2005. Theirs is a well-matched union of generations: Pond moved into the Griswold studio seven years before Clear was born. 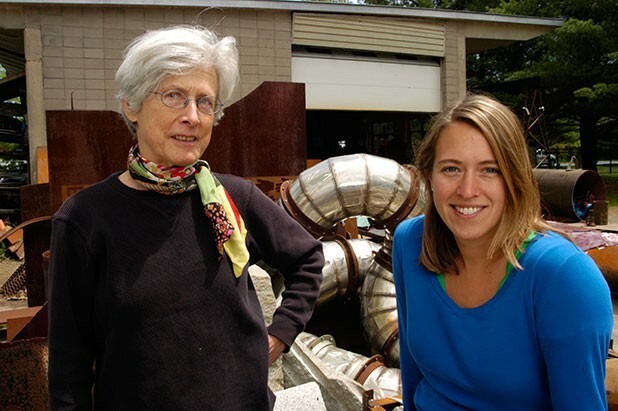 Now 30, the younger artist is happily devoted to the physically demanding career of a metal sculptor. Locals may have seen her “Queen City Crown” in the Burlington Town Center, her bike rack in front of Burlington Telecom, or her collection of “Whoopsie Girls,” inspired by pin-ups of yesteryear. One of these “ladies” is also headed to “Exposed!” this summer. Clear is currently crafting a logo sculpture and signage for Vermont Works for Women and for the new Bluebird Tavern on Riverside Avenue, as well as a 10-foot “origami” steel-and-glass lobster sculpture for the Asbury Park Boardwalk in New Jersey, she reports. Heads up, anyone considering sculptures for their grounds: Clear and Pond are having a moving sale on June 19 to divest themselves of as much of their work as possible. “I should clarify that the sculptures are for sale, not on sale,” Pond says. Prices start at about $100 and range into the thousands. As for leaving her long-time workspace, Pond admits she’s been emotional about it. “But being up and down has been good for being present, and for creativity,” she concludes optimistically. Especially if there’s a new place to call home really soon. Want to own some art?